The ever-popular FTDI USB to UART IC now comes with built-in EEPROM and built-in oscillator! 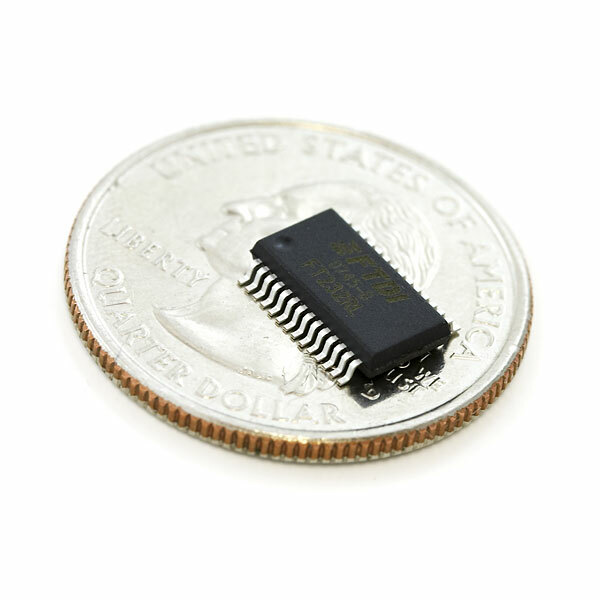 This IC comes in a 28-pin SSOP package and can be soldered by hand. 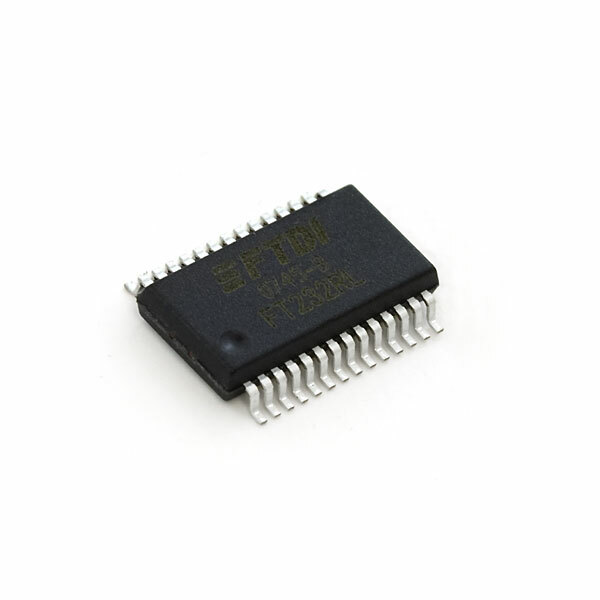 The FT232RL is the latest IC from FTDI requiring very few external components for operation! These are $4.50 on Mouser>> Mad props to Sparkfun! The drivers are for your computer, so when you hook the chip up to your usb the computer recognizes it and converts it to a COM. Whoo! We're killin it. I'm glad we could deliver for you. Has anyone used these effectively? I am currently using the FT311 Android Host chip and am experiencing some strange problems with the UART to USB transfer. I have found very little documentation on what exactly makes it through the uart to usb conversion. I have reached out to FTDI but no response yet. When sending a character from PIC32 to Android a byte makes it through every once in awhile and when it does it is usually surrounded by alot of null characters. On the other side, I have a PIC sending the data RX by the PIC to another TX to a computer terminal to view the data. On this end I get streaming amounts of characters that make no sense. Anybody else experienced this? Do you know what date code you guys are currently shipping? Is it possible to use this as a USB host for mass storage devices? As far as I know, no. This can only work as a USB device and not as a host. It should be pointed out that this device is for SERIAL (RX/TX) transfers. The 245 chip does parallel transfers. What steps would I need to take to replace this chip on an arduino? Would I have to update the EEPROM or just solder it in and go? Note this board also works with BOB-00500 if you wish to incorporate into your project and populate your own capacitors, USB socket, etc by other means. Any one have some code for this? is it needed? You might be best to contact techsupport@sparkfun.com. There is no code needed. could you hook this up to an atmega even though that's usart and this is uart? 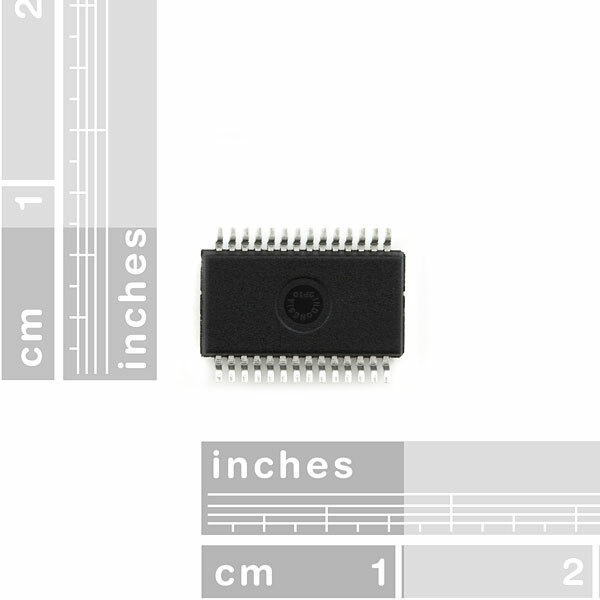 I'd like to ask if this chip is recognized from the PC side as a Human Interface Device. I use mikroC PRO for programming uC and i've seen that it includes an HID terminal. Could I use this terminal to send bytes through this bridge via USB to a uC that only supports UART, without installing those drivers in Windows? Please, if anybody knows, answer as quick as possible because I might need a few of these for my next project. could someone elaborate on how you use the drivers in a microcontroller, do you add it as a header file? or do you have to load them into the chip? how do the drivers actually work as an interface? and once working will it just show up like a normal serial com port where i can hook it into hyperterminal and recieve/transmit my UART transmissions as normal? The drivers are installed on your computer. No special code needed on the uC end. It should show up as a com port. The feature list says that a pull-up resistor is required, but your breakout boards don't include one. What gives? "Integrated USB Resistors - Previous generations of FTDI?s USB UART devices required two external series resistors on the USBDP and USBDM lines, and a 1.5 k? pull up resistor on USBDP. These three resistors have now been integrated onto the device." Before you buy this, have a read through SparkFun's FTDI Drivers and Counterfeit Chips blog post, and take comfort in the fact that SparkFun buys their chips from reputable sources. Great, that's out of the way. loved the first two i bought i had to buy 3 more.